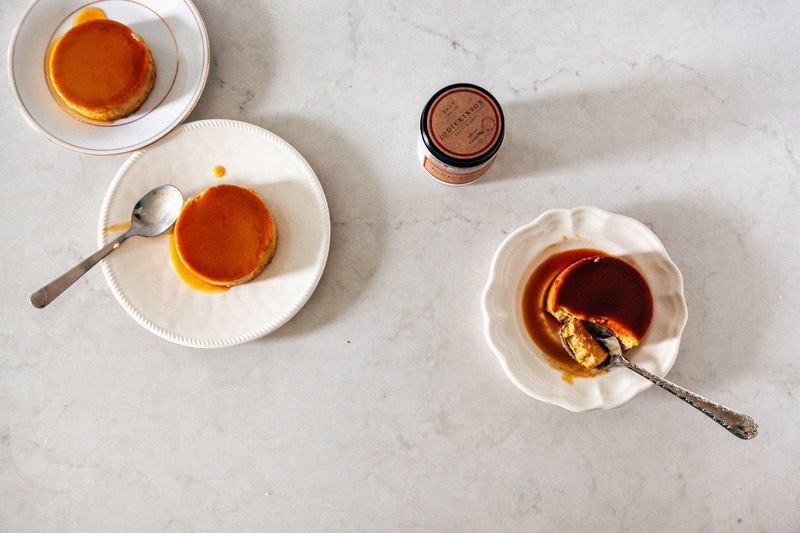 Salted Caramel Pumpkin Flan + A Giveaway! Thanksgiving at my house has always been a very non-traditonal affair; neither Erlend's immediate family or mine really celebrates Thanksgiving, so we've been left to make up our own traditions. Slowly but surely, we're starting to build up a repertoire of Thanksgiving customs — for instance, for the last three years, we've roasted a duck instead of the traditional turkey and I've made momofuku's crispy roasted brussel sprouts with fish sauce vinaigrette. And although the menu is starting to settle, the company seems to be ever-changing. Three years ago, we celebrated with Erlend's family in Littleton, Colorado. My blog was just beginning, and I made this berry topped cheesecake (those iPhone pics, oh my god). The following year was less ceremonious and consisted of me and Erlend eating our roasted duck in a tiny attic apartment in Portland. Last year, it was a friendsgiving complete with my two housemates (one who steamed buns for the duck, the other made full-blown traditional Japanese ramen) and a recently transplanted friend from San Francisco who brought Greek salad. This year, it's another friendsgiving of sorts — a BLOGGER friendsgiving. The ever lovely Renee from Will Frolic for Food has organized a bunch of my favorite bloggers together to celebrate a virtual friendsgiving, centering around one crucial ingredient in both cooking and baking: salt. But not just any old table salt, mind you. We're talking about JQ Dickinson Salt Works salt; that is, high-quality, flaky sea salt, hand-harvested from the Appalachian Mountains. It's the kind of salt that you want to throw on almost everything to just give it that extra something-something, with its beautifully coarse texture able to enhance your dish's flavors. Side note: is flans the plural of flan? That seems... strange. I feel like it should be fancier than "flans"? Is that just me? I feel like I've been bad about baking seasonally this fall. I mean, I completely missed apple season and tried to whip up these mini upside down apple cakes at the last minute that, of course, turned out to be a disaster. But I'm not making that same mistake with pumpkin, squash, and sweet potatoes, nope. Bring on the gourds and the root vegetables, bring it on, starting with pumpkin. 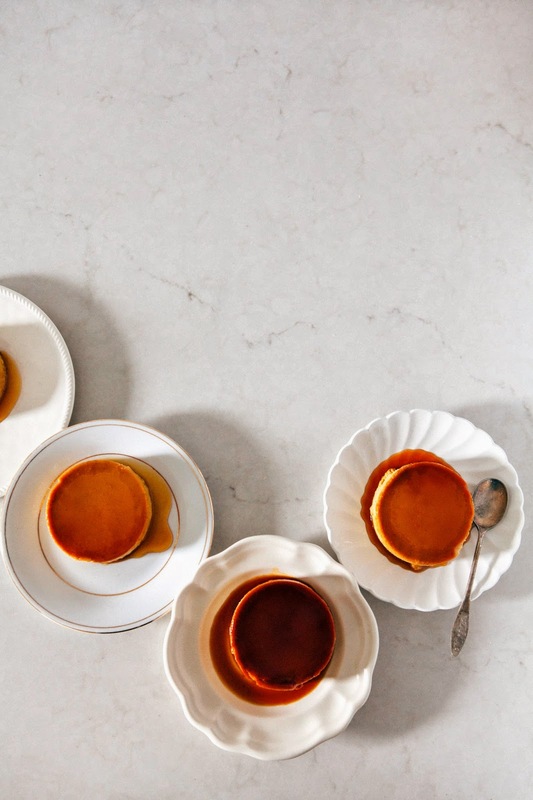 Seriously — if pumpkin pie married creme caramel, these caramel pumpkin flans would be their babies. Their creamy, perfectly balanced between salt and sweet and pumpkin and caramel babies. And as a special Thanksgiving treat, I'm giving away a 1-ounce sampler jar of J.Q. Dickinson Salt, along with some other baking tools to help you out in the kitchen. Enter the giveaway by simply leaving a comment on this post telling me about your favorite Thanksgiving tradition. The winner will be chosen at random and announced on Sunday, November 30th at 5:00 PM PST. The giveaway is open to US and Canadian residents only. The giveaway is now closed! Thanks everybody for entering. The winner is ANNE. I'll be reaching out shortly! Making caramel can be a bit of a pain and a mess, especially if you have to divide the molten hot and burning liquid between tiny ramekins. So instead of cooking the sugar in one pot and doing exactly that, I've decided to caramelize the sugar in their individual ramekins by placing them on burners and cooking them one by one. Now although this method is cleaner, it does take some time and works best if you have a gas or electric burner — it won't work if you have an induction stovetop. 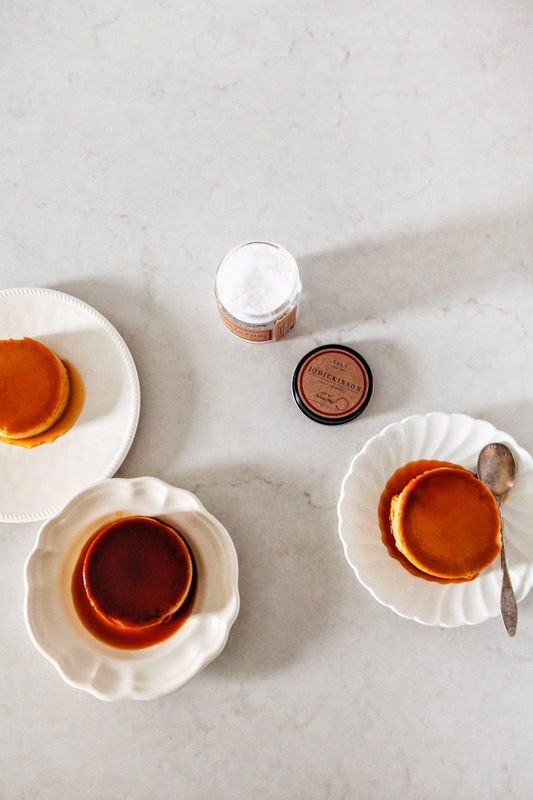 If that's the case, you can also make the caramel by dividing it into their ramekins and broiling in the oven until the sugar is melted and caramel colored. It's important that you cook the flan ramekins in the water bath (as instructed in the recipe). This will allow the flans to cook evenly throughout. But be careful NOT to overcook the flan. Overcooking will result in a weirdly crumbly and grainy custard texture and me crying tears of sadness for you. If you know your oven runs hot, constantly check your ramekins to see how done they are. Flans, unlike cake, are unaffected by the number of times you open your oven door. You can find the perfect custard texture by taking a heatproof utensil and giving each ramekin a gentle tap on its side. If the sides are firm but the center jiggles, you're good to go. If the center is firm, you've overcooked your custard. 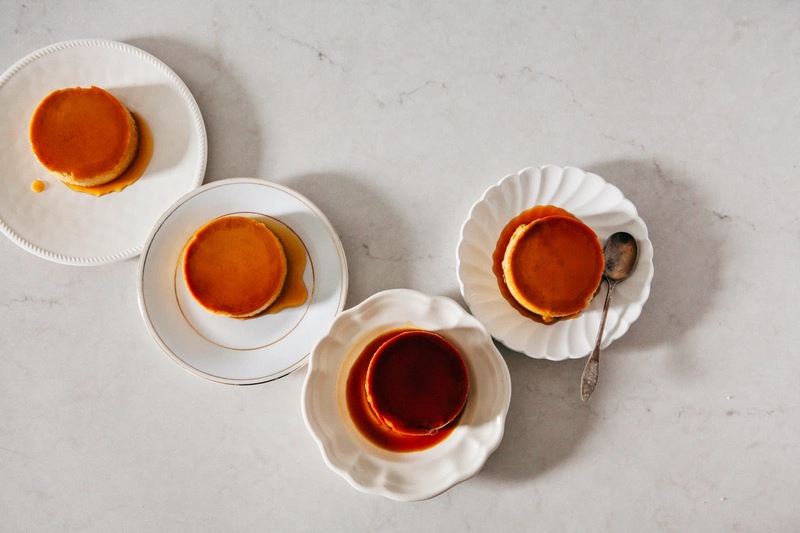 But note that the top of each flan will look weirdly spongy, instead of smooth and creamy — this is due to the pumpkin in the ingredients. If the tops start to brown too fast, loosely cover with an aluminum foil. 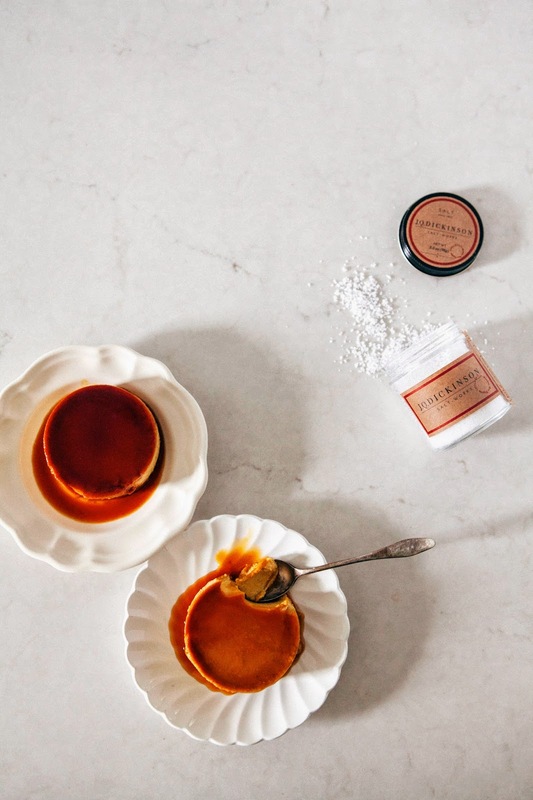 Divide 1/3 cup granulated sugar between 8 heatproof ramekins by sprinkling 2 teaspoons of granulated sugar evenly over the bottom of each ramekin. Top the sugar off with a generous pinch of coarse or flaky sea salt. Place one ramekin on your smallest burner over its highest heat to melt the sugar; the sugar will start to turn brown within a minute or so. Use a small, heatproof rubber spatula (I have this mini spatula and love it) to push the granulated sugar around until it starts to melt and turn the sugar completely into liquid. The longer you cook the sugar, the darker its caramel flavor will be — but remember that it will continue to cook even after you remove it from the heat source, to be sure to remove it from the heat earlier rather than later. 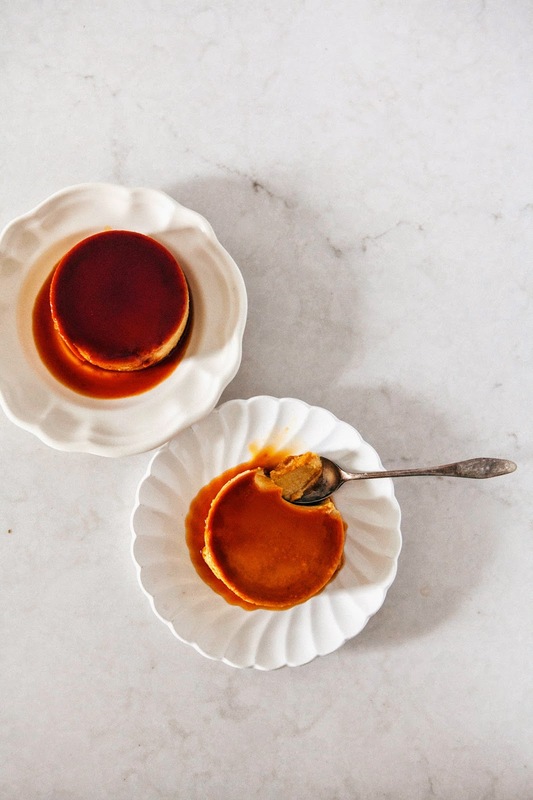 Turn off the burner, and swirl the ramekin to cover its bottom completely with caramel — but BE CAREFUL! The ramekin will be extremely hot at this point. Transfer to a wire rack to cool. Repeat process for the other ramekins. In a large bowl, whisk together 3/4 cup dark brown sugar, 1/2 teaspoon ground cinnamon, 1/2 teaspoon ground ginger, 1/4 teaspoon ground nutmeg and 1/4 teaspoon J.Q. Dickinson salt until thoroughly incorporated. Whisk in 1 cup pumpkin puree until the mixture is a uniform caramel color. In a medium bowl, whisk together 1 1/2 cups heavy cream, 5 large eggs, at room temperature and 1 teaspoon pure vanilla extract until fully incorporated and a pale yellow color. Pour into the pumpkin mixture (from the 2nd step) and use a handheld immersion blender to thoroughly blend the two mixtures together (if you're using a freestanding blender, you can just combine the two mixtures into the blender jug and blend on medium-high speed) until emulsified into a custard. Divide the custard evenly between the caramel-lined ramekins. Transfer the ramekins to 2 baking pans big enough to hold 4 ramekins each without the ramekins having to touch one another. Carefully pour enough hot tap water into the roasting pan to reach halfway up the sides of each ramekin. Transfer carefully into the preheated oven to bake until the custard is set, around 30 minutes. When the custards are done, the center should be a little bit jiggly but the edges should be set (see baker's notes). Transfer to wire racks to allow to cool to room temperature, before covering each ramekin with plastic wrap and allowing to cool and chill in the refrigeration for at least 4 hours, preferably overnight. When you're ready to serve the flans, run a butter knife or an offset spatula around the outside edge of the flan and invert it onto a rimmed plate. Serve immediately. Favorite Thanksgiving traidition: making fried chicken instead of turkey because turkey is kind of meh. Word. Fried chicken is the best, anyway. my favorite thanksgiving tradition is eating leftover pumpkin pie for breakfast the next day. I'm always too stuffed to enjoy it on thanksgiving! YES. my favorite part of thanksgiving has always been leftovers, anyway. and stretchypants, of course. I have a pumpkin roasting in the oven to make pumpkin purée for vegan pumpkin pie for Thanksgiving. I recently made a batch of pumpkin bars but instead of the usually cream cheese frosting, I made caramel frosting. They were so good. I've got to try this recipe. I'm sure my family would love it. You know, I've never made my own homemade pumpkin puree? Mostly out of pure laziness and bad time management, so I have mad respect for people who do it. I'm sure it makes things just that much more delicious! oh yes! those brussels sprouts are my absolute favorite! growing up we use to eat a slice of pumpkin pie with warm eggnog for breakfast on Thanksgiving morning! it was a great way to take a slow start to a very busy day. because really, after dinner, sometimes you are too full for pie, and who wants to skip the pie. This flan looks awesome! And that is my FAV salt!! We have a tradition where we make our Ganny's homemade potato rolls. It's a deliciously unhealthy recipe from the 1960's and they are the perfect size for mini turkey and stuffing sandwiches. oooh turkey and stuffing sandwiches on homemade potato rolls? that sounds amazing. My favorite tradition is the normal one - spending time with loved ones and eating/appreciating delicious foods! Favorite Thanksgiving tradition: in my family, we go around the table right before the meal, and everyone gets a minute to say what they are grateful for. It's so heartwarming! 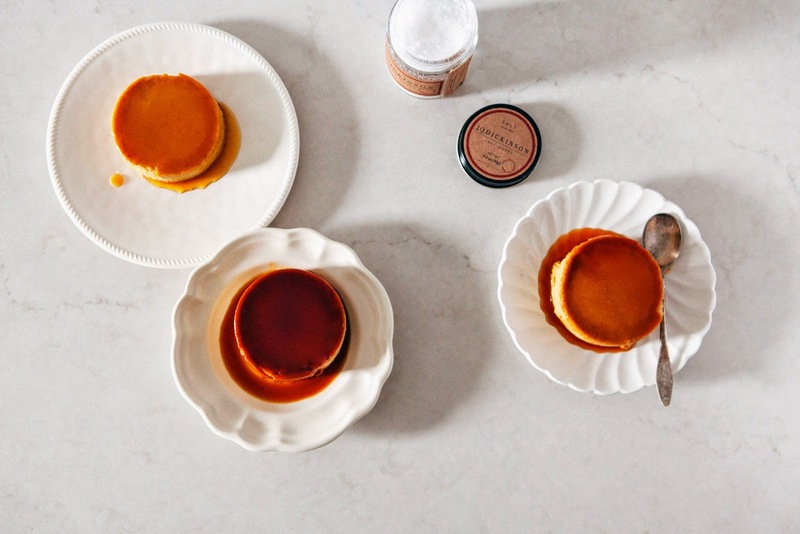 I love it...this flan looks good, I may serve my pumpkin pie with salted caramel sauce, YEAH! aw yeah, that is heartwarming! i wrote a post about what i was thankful for last year, and it made me surprisingly emotional/teary-eyed. i imagine having everybody do that would be really lovely/good for the soul or something. thanks for sharing! I love waking up on Thanksgiving morning and prepping the turkey. I always help my dad tear the bread for the stuffing while my mom does the bird. Once it is in the oven we sit and watch the Macy's parade. My favorite t-day tradition is: spending it with friends! We've had friendsgiving for a god ten years now, and are 100% likely to keep doing it for years on end. Thanks for the giveaway opportunity, and these flans look delicious! friendsgiving is the best kind of thanksgiving, in my opinion. after all, friends are the family you choose right? XOXO cynthia! i've been drooling over your friendsgiving post/recipe for a good week now. those garlic knots OMG. i just had my first bite of flan last week and holy moly why did it take me so long?!?! ?1 sooo good. yours looks deeeeelicious! Our tradition for the last few years has been to go out to dinner at a restaurant on Thanksgiving - it's great! yesss. no work + no crowds? sounds nice and relaxing to me. now do the restaurants you go to have thanksgiving food and serve the traditional turkey, etc? I hardly ever cook during the year but I love cooking on Thanksgiving! I have a (bad) habit of wanting to do it all myself and make special, from scratch recipes. No canned soups or sauces here! i try and make most things from scratch, but honestly i sometimes use a can of store bought broth and pumpkin puree here and there. so wow, everything from scratch? super impressed over here! I've just saved this in about 50 spots in my computer so that I'll never lose it. These flan(s?) look so amazing! Happy Friendsgiving, gal! hahha yess! i love knowing that this recipe is saved in multiple places on your computer. happy thanksgiving to you too! When my dad passed away 11 years ago, we started to take a week off and take my mom to the beach. Each year different combinations of family come and join us. Happy Thanksgiving!! aww, that sounds really nice and lovely. also, beach at this time of year? so jealous. happy thanksgiving! Every year we make (and eat) a family recipe for frozen chocolate pie with whipped cream. It is only made at Thanksgiving so it is special and I can't wait to devour it! i loveeee chocolate pie. like a chocolate silk pie? so good. My favorite tradition is a turkey trot the morning of! Helps me feel WAYYY more justified to eat a huge dinner later! My favorite Thanksgiving tradition is just spending quality time with family, especially over some post-dinner board games! yes! you guys should play cards against humanity, that's my fave. Well, you've convinced me. I MUST try pumpkin + salt!! I LOVE GOOD SALT! These photos are amazing and this recipe sounds ridiculously good! I'm inspired. Husband insists on classic Thanksgiving food every year so I'm just making grain-free pumpkin pies, but I'll have to try a Paleo version of these lovely things later this season!! oooh, a paleo version of flan would be an interesting challenge. while you could likely swap the cream in this recipe with full fat coconut milk, i'm not sure what sugar substitute would work well... maybe maple syrup? it'd hard to get it to caramelize enough for the flan though... let me know what you come up with! yes! mashed potatoes! though my faves has always been sweet potato mashed potatoes, especially with some brown sugar and orange zest? amazing. Hurrah for friendsgiving! I was so excited when I saw what you were posting because these flans sound out-of-this-world amazing. yes!!! your brownies looked equally amazing as well. seriously, they are on my to-make list. Love this recipe. I Should try making this one for thanksgiving. Instead of just buying on groceries online. I'll be making a flan instead of the usual pie. Also, going out for Mexican food is my choice over turkey. Thanks for introducing me to a new salt. Have a great Thanksgiving. We have started a new tradition within the last couple of years. We go out to a very nice restaurant for our Thanksgiving meal. No cooking, no cleanup, and the joy of all of us together. somebody else mentioned that, and honestly, that sounds amazing too. no clean up??? sign me up any day. Yeah, my family actually doesn't celebrate Thanksgiving either — my mom is from the Philippines and my dad is Dutch, so they've always found it a strange holiday. Your friendsgiving last year is kind of my dream Thanksgiving. I would happily trade out all traditional Thanksgiving food for pretty much any other cuisine, except maybe the pies....yeah, definitely keep the pies. Our Thanksgiving tradition is usually a classic turkey dinner with my mom's side of the family, but this year, we're mixing it up, and my grandma is hosting us at her retirement community! Hope you have a wonderful Thanksgiving, Michelle! your grandma is hosting you guys at her retirement community?! omg, that's the cutest thing i've ever heard. enjoy! My favorite tradition is leftover turkey sandwiches with cranberry sauce...yum! yes! turkey sandwich leftovers are the best! at my college, hot turkey sandwiches were on thursdays and there was always a crazy long line for them. My favorite tradition is making a pitcher of Fall sangria to sip on before dinner. Yum! Yes! I love sangria, and can only imagine how tasty it is with fall fruits like apples and pears. My favorite tradition is my son and me eating pumpkin pie for breakfast on Friday! YES. Pie for breakfast = the best kind of breakfast! My favorite tradition associated with Thanksgiving is making a big batch of stuffing (well, I suppose it's actually dressing, since I bake it separately from the turkey) which is based on the stuffing my mother used to make. Every part of it reminds me of her--dicing the vegetables, adding milk, flavoring it with sage, and finally eating it. I miss her so much, especially at Thanksgiving. I love cooking up a storm with my mom! I like to make roasted brussels sprouts, which I cook for a few minutes and then sauté with brown butter in a skillet. The nutty flavor they produce is making my mouth water just thinking of it. I seriously just printed out this flan recipe, as I'm going to make it next week for a party.....Thank you for a fun contest. After reading some of the other fun traditions it reminded me that I usually make turkey n sour cream enchiladas with the left over meat. Yesterday I wish I had made them. I had the hunger, but I went to someone's home for Thanksgiving this year. I love flan and pumpkin, but never thought of a pumpkin flan. It looks (and sounds) delicious! My favorite Thanksgiving tradition is making and eating cornbread dressing using fresh pecans from my dad's trees.